I recently attended a beach day & bonfire for a best friend's birthday! I decided to keep things casual with a bandeau top and netted blouse. Since I knew I was going to be out in the sun and wind in a carefree setting at the beach, I decided to take a risk and wear this netted crochet blouse with only a bandeau top! I never really show my mid-riff, but I took the jump this time! 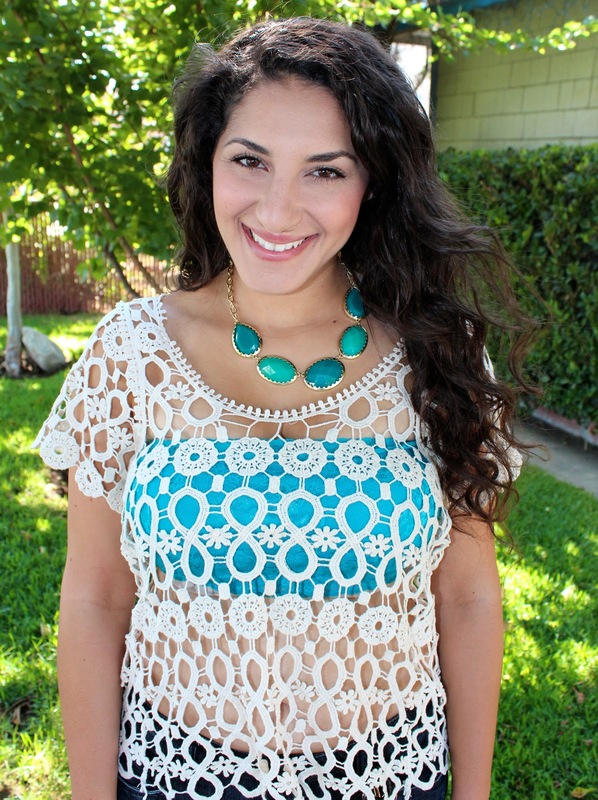 I really like the pattern of this crochet blouse, in particular, because it varies throughout. I especially like how the pattern becomes more fine and "teeth-like" around the neckline. I think it's pretty unique from other similar tops I've seen. The crochet top and aqua lace bandeau top are both from the Pink Zone clothing boutique in the Gaslamp District of San Diego. The dark-wash, cuffed jean shorts are from Forever 21. For accessories, I'm wearing a blue-gemed necklace from So Good jewelry in San Diego, blue bracelets (forgot where I got them! ), and my Michael Kors Ryder sunglasses. Nail polish is Sally Hansen Xtreme Wear in Pink Pop. For makeup, I kept it really simple, since I was going to the beach. I'm wearing a shimmery wash over the lids (e.l.f. mineral eyeshadow in Celebrity) with a light brown shade defining the crease a bit. I'm also wearing a pink blush (Milani Baked Blush in Dolce Pink) and some mascara (L'oreal Voluminous Original in Black Noir).